Asbestos is well-known for its ability to serve as a highly effective insulator that helps prevent electrical components, boilers, pipes, and other materials from getting too hot and causing a fire. However, it is important to remember that asbestos is not actually fire-proof, but only highly fire-resistant. If exposed to flames long enough, asbestos-containing materials can and will burn. This creates a very dangerous situation during and after the fire. Smoke inhalation poses a serious risk to first responders and other individuals who may be in the immediate vicinity of burning asbestos-containing materials. Minute asbestos fibers can become airborne when materials like insulation, roofing, ceiling tiles, flooring, popcorn ceilings, etc. burn. If these fibers are inhaled, they can potentially contribute to serious health problems including cancer. The CDC recommends that no one go within 1,000 feet of a burning structure known or likely to contain asbestos without proper respiratory equipment. Firefighters should also take care to leave their respirators on even after the fire has been extinguished, as asbestos fibers could still be in the air. After a fire, a pile of ashes, half-burned, and unburned but damaged materials may remain. If asbestos was present in the structure that burned, all of this debris could be contaminated. Disturbing the debris in any way, even to remove it, would then result in the release of asbestos fibers into the air where anyone could breathe them in. We can even help in the aftermath of severe natural disasters such as wildfires, when the EPA may issues No Action Assurance letters to property owners. These letters change the legal requirements for asbestos remediation a bit by allowing for a damaged structure to be demolished without first removing the asbestos as would normally be required. Proper disposal of the resulting waste will still be required in such a scenario. 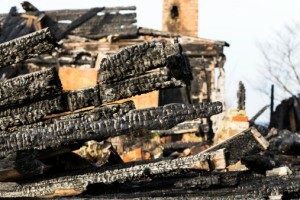 We can guide you through the entire process of cleaning up after a fire so that you can rest assured your property is clean and safe.